If you are looking at supplementing your daily diet with kefir whether it is in the form of including a kefir drink or a kefir food in your meals, chances are that you will go the way of finding a kefir drink or food that suits your requirement, at your local store. The other options available to you would be doing kefir the healthier but more involved way – by making kefir at home, and there is always the route of ordering your kefir drink via the online channel. No matter which of the paths you choose to walk for kefir sourcing, you will come to some stumbling blocks. Here’s why we say this: There is a splendid array of kefir foods out there in the market. Some popular brands offer as many as 6 groups of kefir drinks targeted to specific audiences and each group has 4-5 products! Agreed your local store may not offer the whole range of kefir foods and only the ones that move off the shelves fast into the shoppers’ trolley, yet it may not be the best kefir food for you. A good number of kefir foods and drinks available in the market currently are not 100% dairy free. So, in case you are moderately lactose intolerant or vegan by choice, most of these kefir drinks will not sit well with you and you may want to try non-dairy kefir foods. Yes, there are brands that excel in non-dairy probiotic drinks as well and put out an impressive number of variants to choose from, but some health enthusiasts want to keep their sugar intake low and protein intake high instead of the other way around. There are several other factors that may concern a median prospective kefir buyer. Such factors as usage of genetically modified ingredients in the process of large scale manufacturing are things you would want to watch out for. 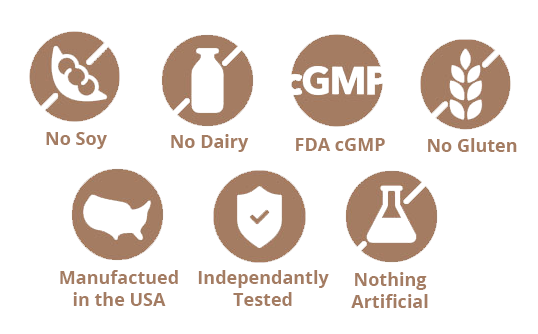 Be extra careful to read the labels of soy kefir, almond kefirs and hemp milk kefir variants as they tend to use the genetically modified ingredients. Whereas most of the rice kefir options will use the NON-GMO ingredients. If you care to read deep into the labels of a few larger commercial kefir brands you will find data on added colours, added flavors, and good quantities of sugar in their ingredient list. In fact brands that turn out smaller quantities for sale into the market because of limited capacity of their production facility are more true to the word they mention on the bottles they sell. They are also subject more rigorously to lab tests. Then there is the question for those who opt for the soy milk kefirs and want to remain vegan and lactose-free. Soy itself does not contain any gluten but because it is almost always a crop grown in rotation with wheat which does contain gluten, there is often cross-gluten contamination during harvest, transportation, storage and even in shared processing units. This almost leaves a good percentage of eager kefir buyers in a limbo eventually compelling them to make their own milk-based, plant-based, juice or water kefirs where they have full control of all the variables to their own suiting! So, is there a way out to ensure that we get our daily shot of kefir goodness without setting out to making the correct amount and storing our own kefir or going on the near-elusive chase of finding the ‘right’ kefir food for ourselves? Enter kefir supplements. A few brands are providing to these harried but health-sensitive and fitness-aware customers the convenience of kefir in the form of supplements. Kefir supplements like KEFIRAN™ simplify things by delivering a over 50 billion active probiotic cultures in just two small capsules per day. Kefiran give you the full dose of probiotics that you need but without the mess of making your own. Ease of Sourcing and Use Trouble sourcing ‘right’ kefir from local store, making it at home. Use as a drink or a milk substitute in baking, used to top pasta dishes etc Order Kefiran supplement directly from us online. Use as directed on the bottle. Capsule. 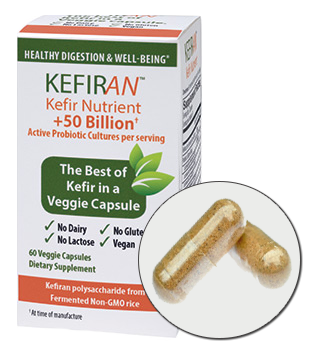 2 KEFIRAN capsules provide 20mg of kefiran the polysaccharide plus 50 billion active probiotic cultures. KEFIRAN is 100% vegan friendly, contains no gluten or lactose (dairy) and is low in Calories. KEFIRAN capsules are small and easy to swallow, are neutral in taste and have no added colors (natural or synthetic) and no added flavors (natural or artificial) in their composition. So realistically.